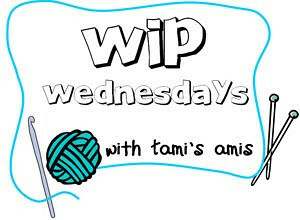 As the title suggests, I am currently working on mittens. I was inspired by the mittens I knit for Martin at Christmas. These new ones are marvellous mittens and everyone wants to steal them from me. 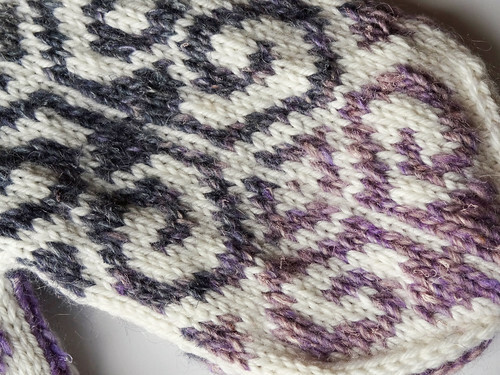 I am enjoying these mittens so much, and I am drawing out their knitting so I can knit them for longer. It helps of course the this Winter is yet to really kick in, and my hands haven't yet required mighty mittens of great thickness. If it gets colder I may speed up my knitting process. So after all this preamble I will share my first finished outer mitten. 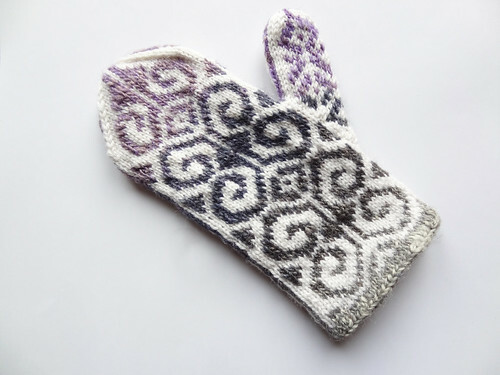 This is a Fiddlehead Mitten which is designed by Adrian Bizilia of Hello Yarn. I loved this design from the first time I saw it, but as it required several contrast yarns, I decided that I wouldn't be knitting it anytime soon. But, a few weeks ago I found two skeins of Noro Silk Garden Lite that needed to be scooped up and made into something beautiful. 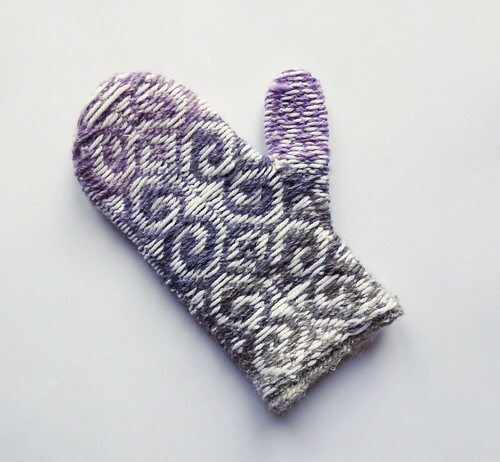 They needed to be Fiddlehead Mittens. I decided that in order to maximise the buttery softness of this yarn, it should be teamed up with a contrast yarn that was equally soft. I decided on Debbie Bliss Cashmerino DK. I am really happy with my yarn choices. This design uses an I-Cord cast on, which I'd never done before, but I really like the nice rounded edge it creates. The instructions in the pattern were clear enough that I didn't have to go looking for a tutorial. I think I may use it in the future on something else, as it's a useful new technique to add to my repertoire. Now I have started to knit in the Continental style, I have found stranded knitting so much more simple. I hold the contrast yarn in my left hand and the main yarn in my right hand and knit the appropriate colour with the relevant hand. It speeds thing up no end. I also chose to knit the mitten inside out so the floats didn't pull across the back of the fabric. As you can see, I've done pretty long floats across the back, but as there is a lining to the mittens I didn't think it would matter, as I will not be able to catch the floats when I wear the mittens. I really have enjoyed watching the colours gradually change on the contrast yarn (the Noro) as the long stripes emerge. It makes it as effective as having several contrast colours, but without the hassle of weaving in ends! I have done the cast on to the second mitten and plan to take this project with me for a train ride back to York to see my family this weekend. I hope to then gently block these outer mittens and then I will have to pick up from the I-Cord cast on and knit the inners in the Cashmerino yarn. These are going to a VERY cozy pair of mittens as effectively they will be three layers thick. I am going to be toasty warm and stylish too! To check out other projects still in progress, click on the button!